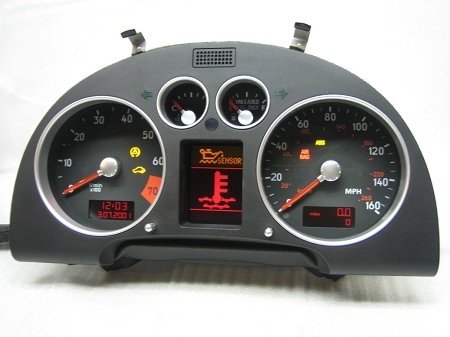 Professional repair service for the Audi TT instrument cluster. The 2000-2006 Audi TT instrument cluster is notorious for failing after few years of use. Failures include pixelated LCD driver information center display, erratic or non functioning temperature/fuel/speedometer and tachometer gauges, flashing or disappearing clock and odometer display, as well as parasitic battery drainage. The 2001+ TT models are equipped with engine immobilizer. Therefore, cluster issues/failures might also prevent the car from starting and leaving you stranded. The above mentioned failures are mostly noticeable during temperature and humidity changes, but get worse with time and eventually become permanent. This service fully restores your failing/failed instrument cluster. Multiple components are replaced, including the on board Motorola MCU responsible for gauge operation. The new microprocessor is flashed with updated EEPROM and FLASH to restore full functionality. * Clean inside and outside of all glass components. Customer responsible for inbound shipping charges. Please note that the repair will not effect your immobilizer (if equipped) or odometer status. Repair process involves removal and shipping of your own instrument cluster for repair. The repair is processed within 48 hrs, plus shipping/transit time. You will receive the exact cluster you shipped for repair. Cluster will be plug and play and no coding/re coding is required by the owner. The immobilizer will be configured so that the car starts without any delay or lockout time.